If you are a happy cat owner, you may need some furniture for your pets, to amuse, entertain and make them feel at home. 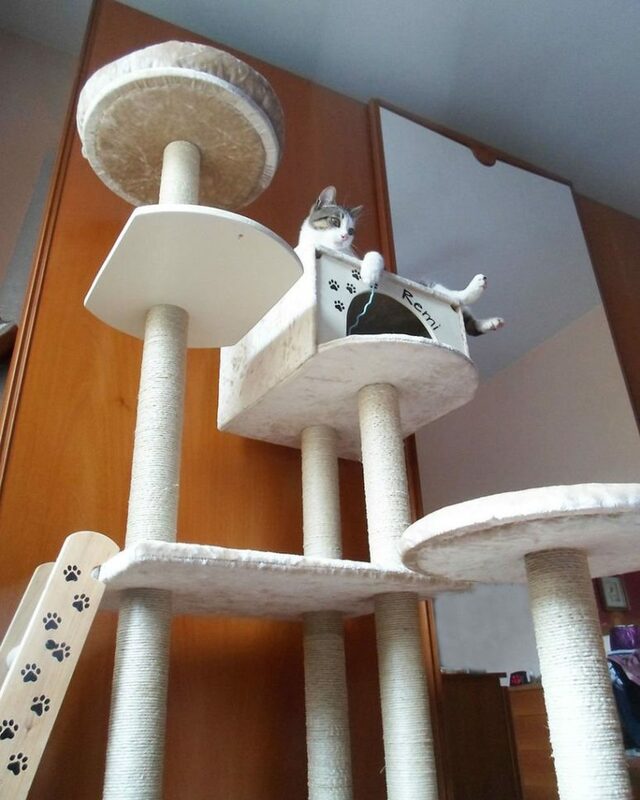 Cat trees and cat towers are amazing for your cat to climb, scratch, sleep and much more plus cats love staying somewhere up. 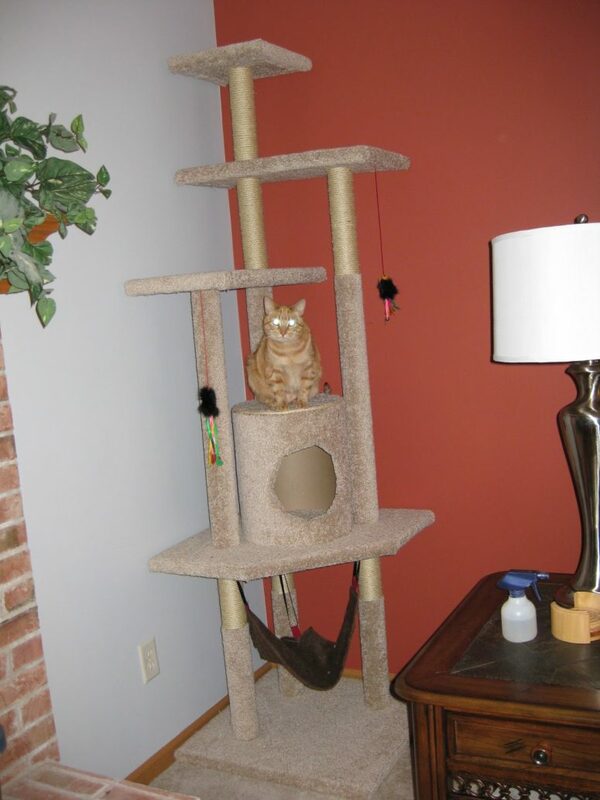 Here are some ideas to build cool cat trees and cat towers yourself, no money wastes involved! The tall, narrow tower with a wide base easily fits in an unobtrusive way into a corner or in front of a window. 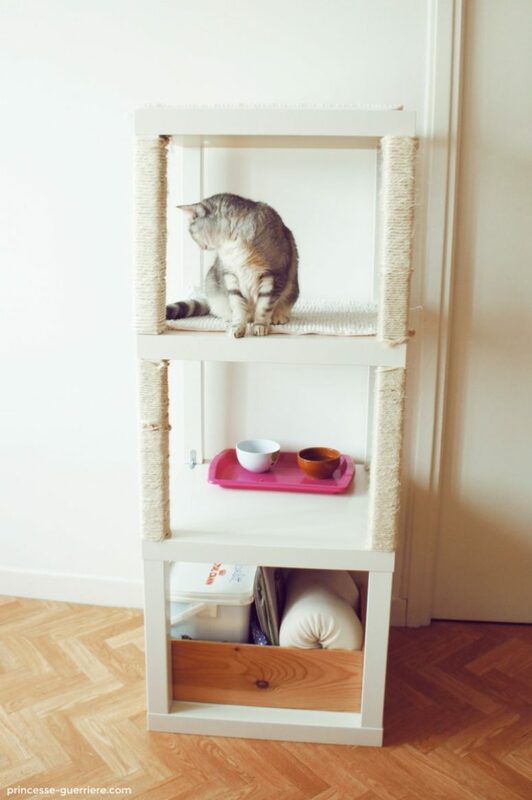 Learn how easy and inexpensive it is to make cat condo where kitty can climb, scratch and nap – just read the tutorial and make it for your pet or pets! The project won’t cost you a lot, and the result is no worse than a bought one. Usual cat trees aren’t about any real trees, this is just a name. But this piece is inspired by realistic-looking cat trees and looks accordingly! The resulting piece is a cat tree that really resembles a tree and there are even rocks downside to imitate a landscape! The rocks are big enough so that neither cat will understandably mistake the base for a litter pan nor it will try to eat them. The stepping stones allow them to walk around the base and will help you keep costs down since they are so much cheaper than the rocks. 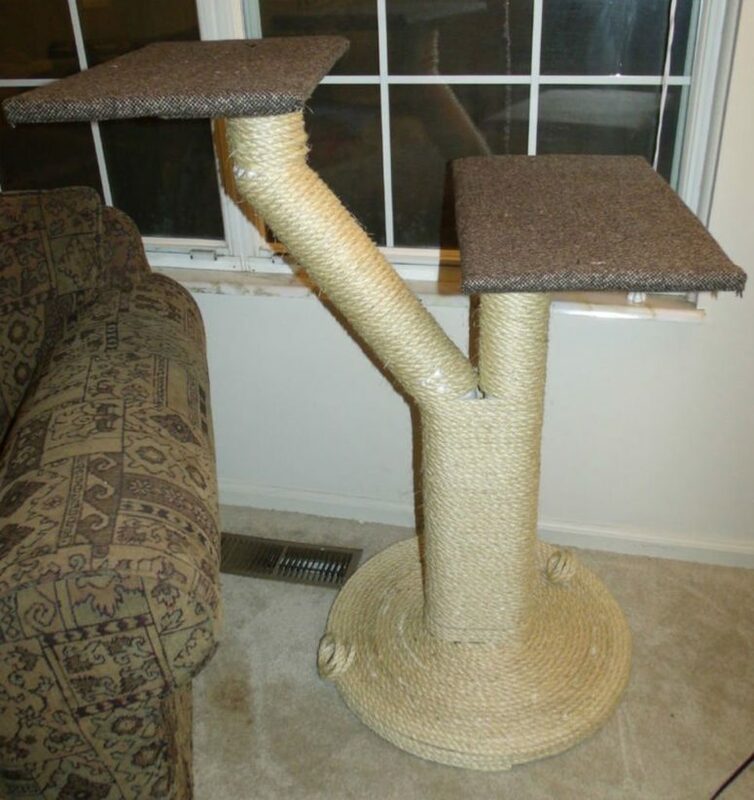 Here’s a simple and basic cat tree with parts covered with carpet for more comfort plus it includes an IKEA hack, isn’t that what we all love? This cat tree consists of an old kitchen unit, a carpet tube, artificial turf and 3 x Sindal mat from Ikea. The tree was made over a weekend and provides endless fun and games for 3 cats (or even more). Big cat trees are beautiful but really expensive. But you can make one much cheaper yourself, for not even half of the price! Even if you are going to build one too and don’t have all the materials, you can buy them spending just a few dollars. Read the tutorial, personalize the tree as you want and make your kitties happy! Don’t forget to add the ladder to it and let your cat explore it! The small base can be moved, this way you can keep it on the side, or form an angle that doesn’t require that much space. let your pets enjoy! 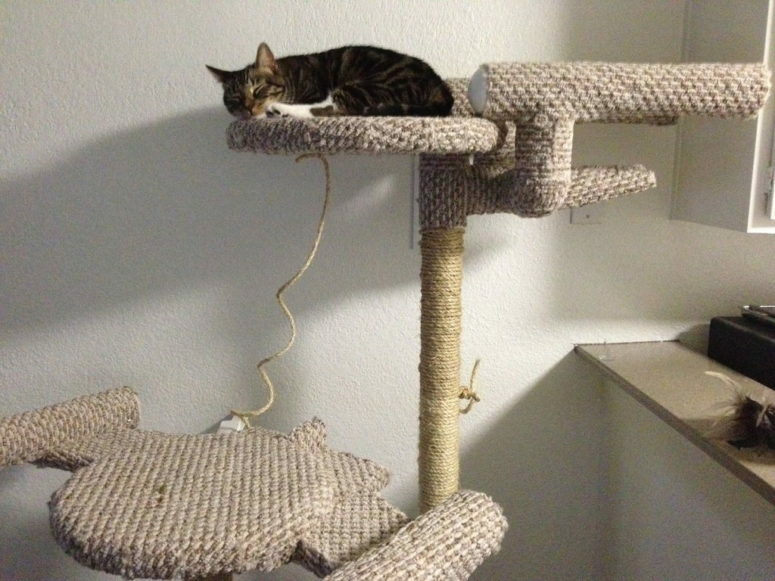 Use everyday items to build a fancy cat jungle gym! Create a customized kitty playground by repurposing old dresser drawers. With so many different areas to explore, curious kittens will never get bored. What I totally love about this cat condo is that it brings a cozy rustic feel to the space with those baskets. Watch the video tutorial and make a cat tree yourself. This project contains detailed instructions on building a cool cat tree. This is a perfect item for every kitty considering the parts that it includes. The cat tree includes a cool house as most of cats love hiding and fitting into small places, where they feels safe and warm. When are a little unsure of things, they like to climb to a spot as high as possible, allowing them to keep an eye on things. 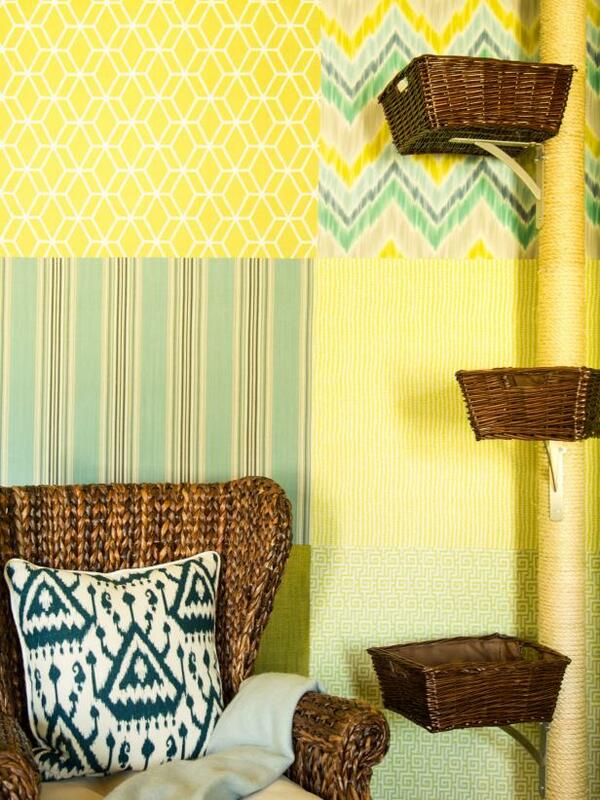 read how to make each part and compose them together and make your pets happy! 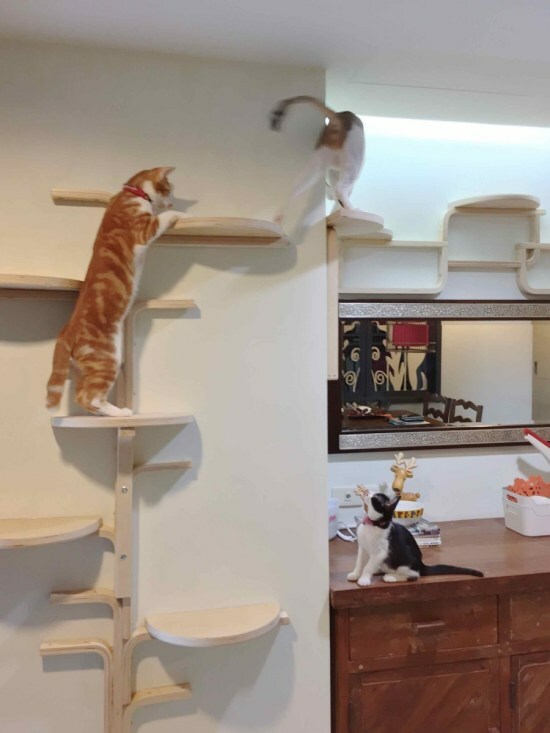 Whether you have several cats or just one, they all love and want climbing. Considering this fact, building a wall cat tree with lots of parts is a great idea. This tutorial will tell you how to repurpose some IKEA Frosta stools and make a great wall-mounted kitty tree. If you don’t have any wood-working skills, this project is gonna be hard but if you do – no problem! This cat tree is another IKEA hack and it features several functional parts: storage, a cat feeding station and 2 beds on top as cats prefer staying higher. The whole piece is built of IKEA Lack tables and show some scratchers, too, so this piece is very multifunctional. The project itself is very simple, stacking and attaching tables isn’t that difficult. 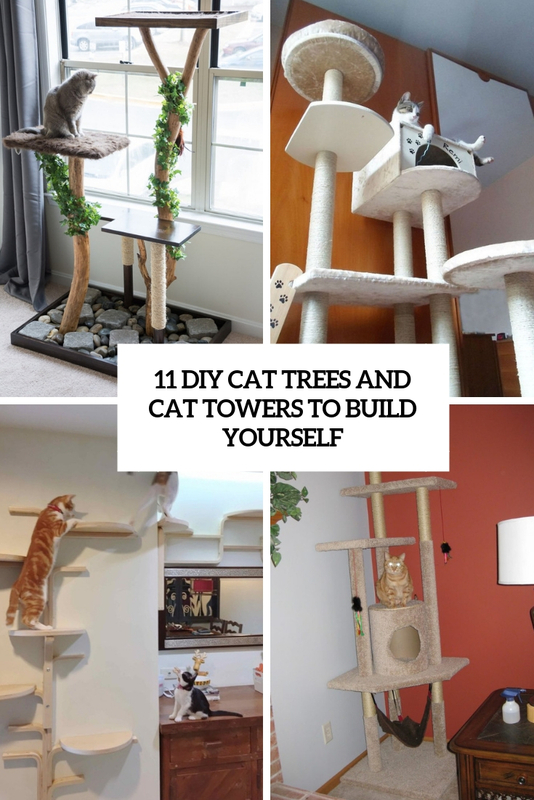 Cat trees and condos are rather expensive but if you are ready to work and spend some time, you can make it for some bucks. This cat condo is built of MDF and is covered with fabric and jute for more comfort. There are several different levels for kitties and as this is carpet, your cats may use it as a scratcher. Let them enjoy! 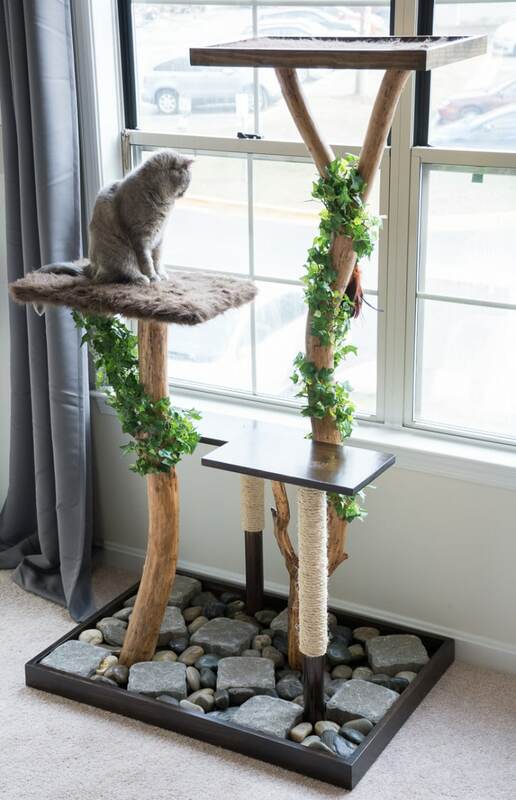 This cool cat tree is inspired by Star Trek! This tree is with Enterprise and Romulan Bird of Prey and if you are a fan or a geek, you should make it too. The parts are covered with carpet and other parts are done with jute to make the whole item totally scratchable. Such a creative item won’t spoil your interior, it looks geeky and fun! 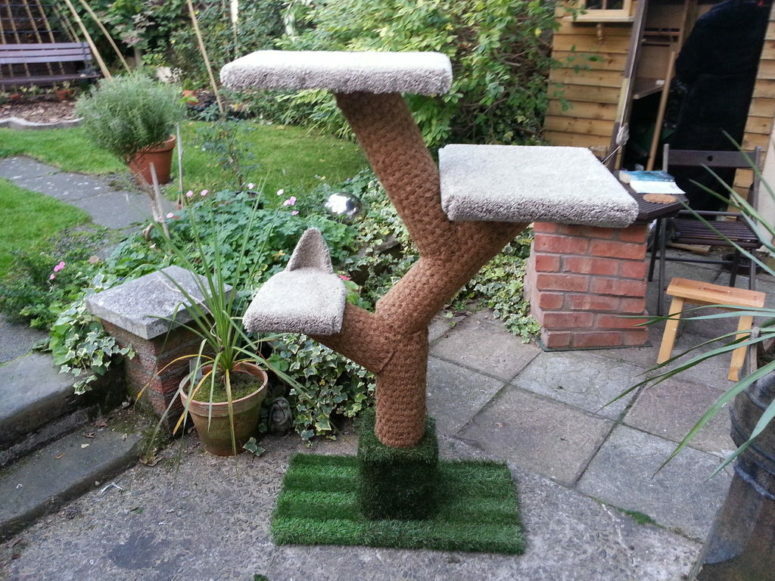 The last but not least is this two platform sisal rope cat tree. 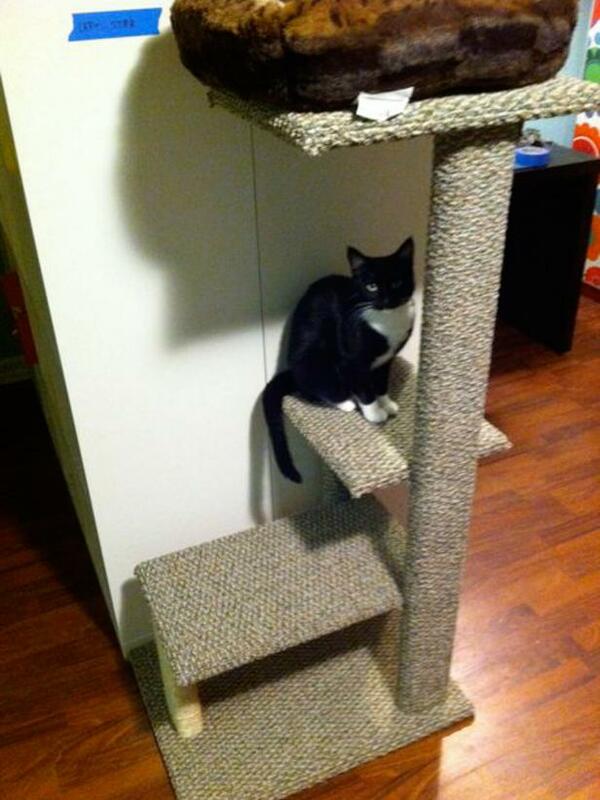 This is an awesome, inexpensive, easy to make cat seat/ scratch post that can be built for as little as 15-20 bucks. 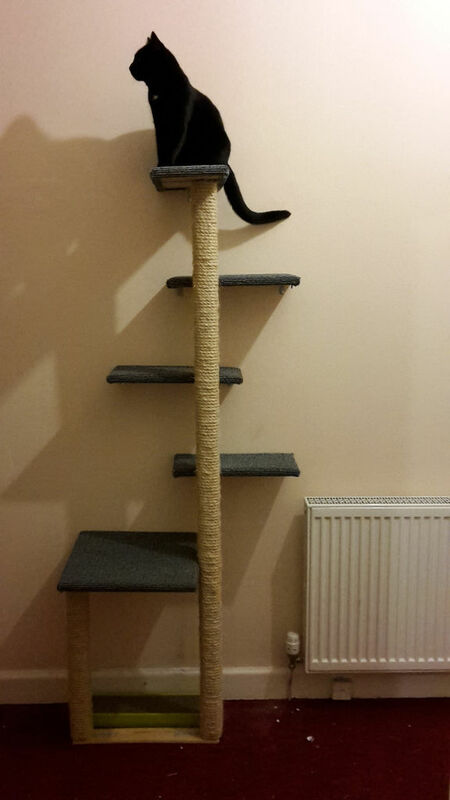 This particular example is more expensive because of the sisal rope, but a nice fabric substitute will lower cost and not the aesthetic value or appeal to your cats. Enjoy!